The following article about a comrade’s experiences is written in response to a recent Hollywood movie called “Dolores” which portrays Dolores Huerta as a heroine of the farmworkers’ struggle—when really, she was the opposite. I am a retired farmworker and I often meet with other farmworker friends of mine who are also retired. Our talks, obviously, revolve around the past at work and about the great struggles that took place, but that today from much of what we won in those struggles only memories are left. For my part, I want to comment some of what I can attest to about these struggles, since I participated in them, especially the strikes of the farmworkers in the 1960’s and 1970’s, against the rich growers of the San Joaquin Valley in California, US. Well, of everything that was won the only thing left is a union that is mediocre as a union, but is a big business administrated by the leaders. Dolores Huerta was the vice-president of the union and the most pacifist one, together with Cesar Chavez. Both had their pacifist policy of accepting the conditions and suggestions of the politicians and growers in the labor contract negotiations. They gave the growers the farmworkers’ movement on a gold plate. 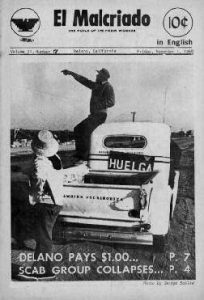 In the period when the strike battles were at their highest points, Huerta sent a number of striking farmworkers to different cities to campaign politically for politicians like the Kennedys and others. She and Cesar sometimes held conferences seeking votes for these politicians, idealizing them as protectors of the farmworkers, etc. When the union declined, Dolores Huerta abandoned it and dedicated herself to campaigning for the Democratic Party politicians. These politicians, as a reward, have declared her to be a defender of the Latino undocumented workers. Nothing is as false as that. Dolores Huerta, during the time that she participated as an organizer of farmworkers and as vice-President of the union, was a staunch enemy of the undocumented workers. She required the membership of the union to report to the union office the names and addresses of undocumented workers to send the Migra (immigration cops) after them. She organized, in the 1970’s, several protests at the immigration office in Bakersfield, California to demand the deportation of undocumented workers. Dolores Huerta and Cesar Chavez, as union leaders, established what was called the Wet Line at the border between California, US and Sonoma, Mexico. The Wet Line consisted of many tents inhabited by union members to help the Migra detain and deport undocumented workers who insisted on crossing the border into the US. What this guy said, under capitalism, is true. The workers can see that only communism will provide the only alternative to change our living conditions. In communism we will not have corrupt governments or politicians or sellout workers’ leaders. We won’t live under the threat of losing our job or being deported as in capitalism.